Every year in the United States, approximately 795,000 persons are affected by Stroke, a sudden injury to brain tissue caused either by a lack of blood flow (i.e. ischemic stroke) or a bleed into the brain (i.e. hemorrhagic stroke).1 Chances are, you have a friend or family member who has suffered from a stroke, and you have seen first hand how life-altering this event can be. In a previous post, I’ve highlighted the commonly used ‘F.A.S.T.’ test as a way to recognize the warning signs stroke so that those who need it can get help quickly. However, in this post, I’d like to focus on the recovery process that occurs once an individual has suffered a stroke, has been treated in the hospital, and is ready to be discharged. In other words, let’s take a minute to discuss Stroke Rehabilitation. A focused rehabilitation that involves activities and therapies designed to help you relearn any skills you may have lost at the time of stroke. This may include therapy to help with speech, movement, or coordination of basic functions. 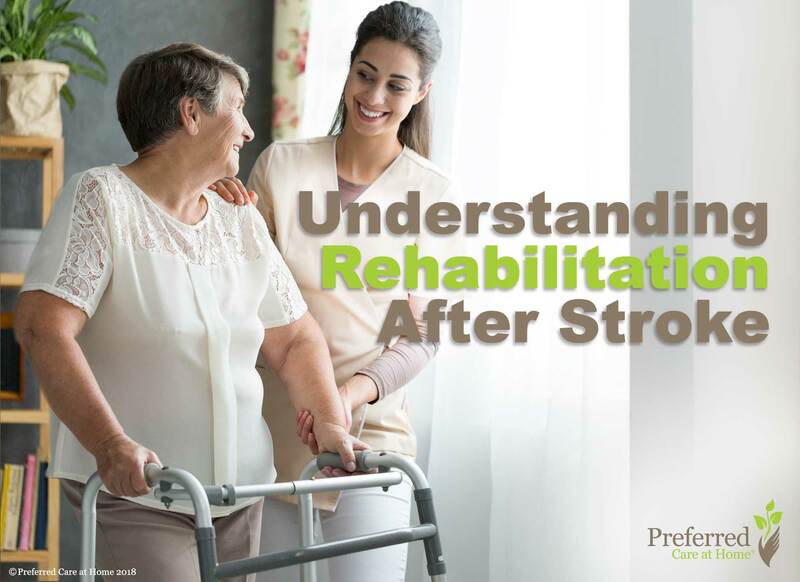 Since every patient with stroke is different, rehabilitation is personalized to your needs depending on which area of the brain has been affected. Why is stroke rehab important? When someone suffers a stroke, a certain number of brain cells in a specific location (and with a specific function) are injured and die. For reasons that are not yet completely understood, other parts of the brain can sometimes be recruited to take over these tasks from the damaged brain. While stroke rehab is not 100% effective and while the ability of the injured brain to recover depends on the specific region that was affected, stroke rehabilitation has consistently proven to increase the chances of recovering functional ability following a stroke. When should I start stroke rehab? Rehabilitation should start as early as possible and for some patients may begin within 48 hours after a stroke. Research has shown that most recovery following a stroke occurs in the first 3-6 months. Early rehabilitation is important to regain maximum skills and improve ones ability to carry out activities of daily living. Who will provide my care during Stroke Rehab? It is truly a team effort. Important physicians include your Neurologist who specializes in the treatment of stroke, and who will provide recommendations to help prevent you from having another stroke. Your Physiatrist is a physician who specializes in rehabilitative medicine and can oversee your care. Physical Therapists will help you exercise, strengthen muscles, and assess your ability to walk, while Occupational Therapists will help you learn how to handle activities of daily living such as cooking, bathing, eating, etc. Psychologists may also help test your cognition and emotional health. Where does stroke rehab take place? Often, stroke rehabilitation will start while you are still in the hospital and may continue at a dedicated rehabilitation facility. However, there are also options for you to receive services at an outpatient center or in your own home. The appropriateness of each of these options should be discussed with your doctor, and together, you should make a personalized decision on the best place for rehabilitation. If you or a loved one have recently suffered a stroke, I want you to know that you are not alone. This may be the toughest challenge you’ve ever faced in your life, and the overwhelming feelings may seem like they will never end. Recovering from a stroke is hard, and for those dealing with significant disabilities, the fight to stay positive mentally and continue rehabilitation can be a daily battle. I want you to know that there are people here for you, who will come alongside you in the battle and help provide the help and resources you need. I encourage you to utilize every option and resource available to you during your time in stroke rehab. Your care providers what to know how they can best help you, so remember to be open and honest in discussing your thoughts and feelings. Keep up the good fight, and don’t lose heart. If you are looking for additional resources, I recommend browsing the website at National Stroke Association “First Steps to Recovery” section. They provide great information on this and other important topics related to navigating life after stroke. Also, be sure to touch base with case managers and social workers at the hospitals or facilities at which you receive care. If you find yourself needing some extra help once you make it back home, contact your local Preferred Care at Home to learn how they can come along side and help those who suffered from a stroke. 1Heart Disease and Stroke Statistics – 2017 Update: A Report From the American Heart Association as published in Circulation. 2017 135 (10) 2017 Jan 25.